The purpose of this workshop is to explore outstanding gardening ideas for maximizing our potential for food (“food” meaning food that you really want to eat, and which your family eats often) and pleasure (i.e. any pleasure, be it the pleasure of leisurely toil, or the pleasure of creating beautiful spaces, or the pleasure of growing food with superior taste, or any other idea that counts for pleasure, for you, when you are in the garden), with the least outlay of unnecessary cash and effort. It is assumed that everyone knows there are numerous practical solutions for getting something done in the garden. The ideas, methods, formulas, techniques seen here have worked successfully for the presenter for many years… HOWEVER… they should only be valued as a point of departure for figuring out the best systems that work for you and your garden. A modest number of the following ideas came by the presenter’s own trial and error, but the bulk came from asking questions of folks who garden much better than himself , and by applying information gleaned from books written by market gardeners who have been telling us how they do it, for the last 200 years. Any information worth making note of has been added to this handout… perhaps to the point of ad nauseam. This should allow you to spend all of your time watching and absorbing various elements relating to some good ideas to increase your gardening potential … that you will see in the PowerPoint presentation. The very best practical solution for improving the quality of your garden: You can go to all the gardening workshops that you want, and yet your ability to improve as a gardener rests on your own shoulders. Improvement of gardening skills is based on figuring out the questions to ask and to then pursuing the answers. The best thing you can do to improve your knowledge base in gardening is to buy two or three different editions of Rodale’s Encyclopedia of Organic Gardening at used bookstores. Each time you plant something new or hear a term that you don’t understand, look it up. Put all your energies in one modest bed and see what sort of results you get. Components for spreading across the entire bed: Regardless of which bed you want to assemble, have the following on hand… 15 bags composted cow manure, 1 coffee can each of greensand, rock phosphate, and lime. Any additional quality topsoil , compost, composted leaves that you can find cheaply. Enough un-waxed cardboard to completely cover a 36”x12’ space. If you don’t want to contain a new garden bed with-in artificial raised sides, go to PLAN B. PLAN A…Materials and Assembly, the harder way, but it is ready to plant immediately: (tools required– garden fork, tarp. hammer or small sledge) (16) 2’ x ½” rebar stakes (find in the masonry isle), (2) 5/4 x 6” x12’ recycled plastic lumber decking (find in the lumber isle). Note: you can get away with buying (8) rebar stakes and (1) 5/4 x 12’ piece of recycled lumber if your garden is on a slope, allowing you to support only the downhill side. Set up the bottom side of the bed where you want it. Pound pairs of rebar stakes at 6” and 4’ from each end so the plastic lumber sandwiches between 4 sets of stakes. Excavate the 3’x13’ area and throw the soil onto the tarp temporarily. Pierce 5” deep holes into the bottom of the excavation at 4” on center from each other with the garden fork. Lay 2” to 4” of composting leaves on the pierced bottom of the bed and saturate with a microbial cocktail (to kick-start microbial action), saturated with water. Pull out all the grass and green that is in the excavated soil and send it to the compost pile. Return the soil on the tarp to the excavated hole, breaking clods and removing any remaining plant life before they go home. Spread composted manure, amendments, and any extra composted organic matter you can to the bed and mix in it the top 3” of soil. Form and smooth bed with rake and lightly tamp bed with backside of rake. Apply more microbial cocktail and gently soak newly raised bed. Cover with cardboard to suppress weeds and sprouting grass left in the clods, Soak cardboard to allow it to conform to the bed, and add strategically- placed stones to keep it from blowing away. It is ready to plant. Go to “Planting”. PLAN B… Assembly the easy way but it takes 5 months before planting: (The Positive Vibe Permaculture Guy, Chuck Marsh, turned me on to this method which utilizes “biological tillage”.) Layout a 36””x12’ area on grass or bare dirt using a hose to mark perimeter. Spread the three amendments. Spread three inches of manure (it is OK if it is fresh or composted) over the area. Water well. Spread three inches of composted leaves (if available) or freshly-fallen leaves, across the top of the manure. Water again. Spread one layer of cardboard over the entire area. Water well. Spread a thick layer of straw over the area. Wait four months. Mow up to the edge of the bed to keep it tidy and accessible. Planting: Cut holes into the cardboard to plant … leaving the cardboard elsewhere to effectively suppress weeds and to allow microbial activity and worms to break down the organic matter in the bed… under a cover which prevents drying of the soil. NEVER STEP ON THIS BED AGAIN… DON’T LET THE KIDS OR FAMILY HOUND STEP ON THE BED… HONEST, THIS IS REALLY IMPORTANT! Add compost each time you plant. Don’t ever turn the soil over again…. REALLY, I MEAN IT!… don’t ever turn the soil over again… remember we want to set up systems which require less and less effort the more we use them… we want the garden to work for us, not the reverse. Always keep the bed covered with mulch or plants to keep the surface from crusting and weeds suppressed. Add organic matter often to the top (right over the cardboard which will decompose also once it starts getting covered with periodic additions of rotted straw or chopped leaves. Let all applied organic materials decompose into the bed, and plant directly into the decaying organic matter. Add garden cocktails when you add organic matter. You can get the most out of this bed by planting pretty darn close, but it requires continual additions of compost, slow release organic fertilizer, or composted cow manure, to maintain fertility and performance. See Mel Bartholmew to learn the elements of his system for achieving the most effective use of small garden sizes. Read Ruth Stout to learn about the mulching way to lazy gardening. Buying Seedlings: Ideally, you will be starting plant materials using seeds of varieties that you have chosen for some specifically desirable characteristic (such as superior flavor, appearance, or weather tolerance) and you have the appropriate basic equipment to make it dependable enough and worthwhile to start your own seeds and raise them for the three to twelve weeks that you need, to bring them to transplant size. But it is much better to buy high quality seedlings in 6-pacs than to plant marginal seedlings because you didn’t grow enough to cull out the best stock, or because your vigilance slipped for a week and the seedlings suffered a setback. When you buy seedlings, don’t be seduced by the low cost of home discount centers… I have found their bi-annuals (such as kale, broccoli, collards) will often go to seed because they were planted too early last season, and then their growth was stunted (another good reason not to buy them); by the time this happens it is too late to get more seedlings in for early season food production and you are cursing your essential cheapskate nature and lack of good judgment. Instead, check the listings, in Mountain Xpress, for the numerous Farmer’s Markets which set up all over the region; these folks have terrific seedlings, raised with love… make sure you ask if the seedlings have been hardened-off or if you will need to do this. Or buy from places that have quality stock, well-considered variety offerings, and knowledgeable staff such as Reems Creek Nursery, Racks of 6-pacs of heirloom varieties show up outside the French Broad Co-op. Don’t buy a plant where the bottom two leaves are yellow… it means they have been stressed. If the plants don’t look excellent, don’t buy them. And don’t buy them and then let them sit around the yard for two weeks until you get around to planting. Don’t be seduced into a whim purchase of a six-pac of Little Gem romaine that you see outside of Greenlife, unless you are going to plant it with-in 24 hours. Basic Equipment: Choose to invest in professional grade washable multi-cell flats. Cut them up into useable sizes to allow you to grow plants in the same flat which are ready to be put into the garden at different times. Spend your money on professional flats and they will last a long time. Under Lampshades: The method with the least amount of effort to get excellent seed stock. Cover a lampshade with floating row cover. Set it in the garden over seeds covered with seed starting medium and leave it alone. The seeds will come up on their own and you can transplant them where you want them. Enlisting Volunteers: Excellent tomato plants come up in any established compost pile. Transplant these hardy little buggers into the garden. In a Cold Frame: The most effective low-effort way to get two to six flats of veggies and flowers going… a good way to grow extra so you can cull out the best, and give away the rest to lucky gardening pals… a good way to gain style points. Make sure the cold frame has a top made of floating row cover so it will allow rain water through to the seedlings. Keep an eye on the moisture content and water them as necessary to supplement the rain. Dampening Off: This discouraging fungal disease (known also by the proper name “rhizoctonia”) is caused by lack of air flow in a moist environment and it happens overnight. The indicator is the seedlings lie prostrate, cut off at the ankles with no cure. Adding ½ cup of strong chamomile tea to 1.5 gallons of the water you water your seedlings with, has been shown to be an effective deterrent to D.O. (To make the tea steep ½ cup chamomile flowers in one gallon water all day in the sun, and store tea in refrigerator.) A very slow fan moving air over the plants is another deterrent and some say it also increases the bulk and health of seedling stems. Seeding Directly: Some plants do just as well if you seed them directly… green and dry beans, peas, lettuce, et al. When you do this, cover the seeded areas with a seed starting mixture that has vermiculite in it. The seed starting mixture provides a weed-free medium for seeds to emerge through, and the vermiculite (actually little pieces of exploded mica) in the mix is a marker so you don’t forget where you seeded something before seedlings emerge. And While You’re At It: Look, you’ve got the basic equipment, and you are doing it anyway, if you haven’t used up all the seed flat cells… just start some colorful annual flowers that you can pop into random open spots with the veggies. Cosmos are a fun flower that start easy and are happy to be tucked into pockets in the veggie bed in clusters of five to seven plants to make a lively showing. They self seed easily for a pretty, random showing the next year as volunteers. Hardening Off: The final step before the seedlings go into the ground… Transplant stock that has been grown under lights are tender creatures. Before planting them in the harsher environment of the garden, place them in a more moderate environment of a cold frame or covered with floating row covers in a somewhat protected place for a week. Goal: You want to be able to have a system where you can change sprinkler heads and add or remove hose quickly, and control rate of flow at the business end of a hose, without needing to run back to the faucet. And you want hoses that don’t leak. You want to set yourself up for effective and frugal use of your most precious and expensive commodity. Quick-Change Connectors: Make a one-time investment in “Quick-change” connectors… enough to be able to set up every hose and sprinkler head with a connection. Buy only brass and buy from the same manufacturer. Buy at least two extra male parts for when you add another sprinkler head or drip hose. Models change frequently and the system you buy this year may not work with parts bought from the same manufacturer next year. Drip Hoses: The 50’ sections of recycled rubber drip hose are a good investment. Lay it down on the bed before you plant and it can stay all season. Make sure it has a quick-change component for trouble-free hook-ups with the hose. Sprinkling Wand: A 4’ wand with it’s own on/off lever, and outfitted with Quick-change hardware, is a joy to own. Mine last about a season but they are a worthwhile annual investment. The sprinkler head should have at least five adjustable spray patterns. Extra Washers: Spend less than a buck every spring and buy a package of hose washers and replace old washers on the female end of every hose and sprinkler head to insure connections don’t leak for the rest of the season. Repair Kits: You are going to cut a hose at least once or twice a season. Keep two brass repair parts in your garden basket so you can make an immediate repair when it happens. very well, and it starts under the lampshade cloche easily for transplanting later in other parts of the bed. A garden bed this small is easy to maintain (after you have established it) and it is cheap to keep the fertility levels raised. You can cover it with block ladder hoops (found in the masonry isle) and floating row covers to extend the season. Or you can put tall cold frame sides and sash on top in the winter-time. If nothing else, you can have a lettuce bed at home that produces salad three nights a week or more. Winter Density: “a great compact romaine/butterhead” does fine in the three coolest seasons and it shines in the winter. Endless Deer Tongue: “it would make me a happy chap if this is all I could grow”; “this one also shines in the spring and fall; “like most lettuces with row cover and plastic, it is fine in the winter, but is outstripped by winter density and tango and in a season when all lettuces really shine its’ matchless qualities are less dramatic. Peaceful Valley Farm Supply: “ most comprehensive, but shipping from California Is costly to you and the environment. One of the most comprehensive suppliers of organic seed. Seven Springs Farm Supply: Live beneficial insects etc. ; it has much of what we need and is in Floyd Va.
Ray’s Bags on Hiway 25… plenty of row cover by the foot or rolls in many widths and weights. Install perennial plants near your veggie plots to attract beneficial insects. Unless you plan to take strong action to restrict them from spreading… don’t plant invasive attractors such as the mints (identified by their square stems) or Monk’s Hood which spread or self-seed aggressively and become their own sort of problem. Plant yarrow, tansy, loveage (which also provides killer celery flavor when chopped and used sparingly), catnip, and dill. Go see any workshop presented by Pat Battle or Richard McDonald to get the low down on teaming up with beneficial insects in your garden. You can find a plastic “2.5 qt multi-mixing bucket” with a lid in the paint aisle… it makes a great compost bucket that can be bought for less than $1.50 . It is dishwasher safe, you can keep extras under the sink for high volume meal prep scrap, and you can afford to throw them away if they get rasty-looking. You can make a fruit fly trap by cutting the bottom off a 2 qt plastic juice bottle… then cut two holes up the side, opposite each other that are the size of a quarter. Half-way up the bottle, run a skewer from one side through the other and put a section of lime on the skewer inside the bottle. Now keep the cap on the bottle and set it on top the lid of the compost bucket. Fruit flies will gather inside the bottle under the cap and won’t be able to escape. Take the bottle outside and turn it upside down to release the fruit flies. Biggest cloves: (you’ll get 3 to 5 premium cloves per bulb) Make 3” deep holes with your middle finger, 6” on center. Drop the cloves into the holes with points up. Fill holes with a handful of compost and pat the rest on top of set. Sprinkle one tablespoon of bone meal over each clove set. Cover bed with a solid 3”-4” layer of straw. They are ready to do their thing unassisted by you from early fall until they get harvested next mid-summer. Middle-sized cloves: Take them to the kitchen and store in a paper bag. Use them for cooking. Smallest, skinniest cloves: Set aside a 12”x12” area that is free of weeds. Use a pencil to bore holes 2” deep, and 1.5” on center. Slide skinny cloves into the holes and cover plot with 1.5” of compost or composted cow manure. Each clove will produce 1 flush of mildly garlic flavored chives that can be cut off with a pair of scissors as you need it. Don’t try to use only marginally large cloves to plant. Big cloves make big bulbs. Next late July when you harvest the bulbs, cull out the best for planting a month later. Look up “garlic” in your Encyclopedia of Organic Gardening and read everything you need to grow and harvest your own. Austrian winter pea is a terrific cover crop to seed on a bed in the fall that you won’t be planting in crops, or that you want to rest. In the spring… three weeks before you want to plant… smother the winter pea crop with a layer of compost or thick straw mulch and plant right into it when the time comes (remember, we aren’t turning the soil on our beds… that’s too much work). The best part is that you can graze on the pea leaves all winter… makes a great cold weather pesto and it’s a great addition to salad. Pat Battle has been raving for years about the quality taste of a variety called Ho Lan Dow when planted as a cover crop. The following is to make a covered frame sized 3’x5’. It is intended to be moveable… you could put a large handle on each side to move it easily. Tools: Screw gun w/ #2 Phillips-head driver bit, staple gun and 3/8” staples, tape measure. Semi-permanent install with growing area lowered inside frame. Ground burmed around the perimeter to insulate and keep water from penetrating. Interior growing surface angled to benefit from solar gain. Sash covered with floating row cover rather than plastic or glass to create an enhanced environment that won’t overheat when you are aren’t nearby to open it for venting. Using 1×3 pine, and making panels using bent framing plates… and covering it with plastic or floating row covers… gives you endless possibilities for making season extension contraptions. Remember, you want to make sure you allow for venting hot air in some manner (the simpler, the better)… it is easier for plants to recover that have been chilled than for plants to recover that have baked from inadequate venting. The two frames shown below are exactly the same size. The cut edge of the side pieces is marked with an arrow in both illustrations. It is easiest to assemble the frame as shown on the left on a flat surface. But when it is assembled, turn it upside down as seen on the right . This achieves: (1) a flat surface for the sash to sit on (without requiring a difficult bevel cut along the entire length of the top and bottom piece), (2) a little bit more surface area on the growing plane, and (3) an entire interior that is angled more to the south so less shade is created on the surface area at the south side of the frame. 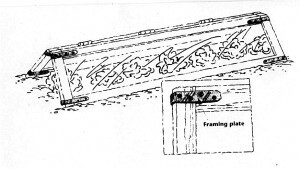 Note: the presenter, posing as an illustrator, was unable to draw a reasonable-looking perspective view of the coldframe in the above drawing, that would include sides which are appropriately angled as the right side illustration shows below. And another thought: studies show that white is the appropriate color to paint the interior because more light is reflected inside to enhance plant growth… a coat of exterior primer on the inside is perfect for this application. Buy three 6-pacs of old-time, open pollinated lettuce, all different varieties. Plant all 18 plants into an 8 to10 square foot area of raised bed that has been amended and set aside for this project, keeping the varieties separated for your convenience. As the lettuce matures, harvest the first three plants of each variety as it becomes ready and eat it. Pay close attention to the remaining nine plants and mark the plant in each variety that is the last to go to seed. Destroy the six plants that were the quickest to go to seed. By saving the plants that were the slowest to go to seed, you are insuring that the seeds from those plants will produce plants that last longer in the garden before going to seed. You have just selected these plants to be slow-to-bolt. Allow these three different plants to mature to full seed heads. When the seeds are mature, birds will begin feeding on the seed heads which in turn will spread the seeds everywhere across the bed you have prepared. Remove weeds that might appear and wait as the lettuce seeds germinate. Thin seedlings in this “seedbed” to 2” apart and transplant into rows or open spaces in other beds when the first true leaves appear… or thin to 10” on-center and allow them to grow right there. Buy an “Ortho Dial n Spray hose-end sprayer” and rig it with a quick-change device. It holds about 4.5 cups of liquid. I generally set the dial from from 3 oz to 8 oz. (“4 oz” will add 4 oz of cocktail per 1 gallon of water passing through the sprayer) to provide a solid dose of cocktail. If you are adding microbial inoculants such as EM, allow cocktail mixture to sit in the container for one hour before spreading, while the sugar from the molasses wakes up the dormant micro-organisms and they start to feed on the molasses; the recently awakened feeding activity will carry down into the new environment you are introducing them to and they’ll stay awake until they have no more food to process. Spray foliage and the ground below before watering or a rain with: 1 cup each of strong nettle tea, water, liquid seaweed. Add 1/8 cup EM and 5 tbsp. Molasses. Spray each 6” layer in the compost pile as you are building it with accumulated organic matter using: 1/8 cup EM,1 cup nettle tea, 5 tbsp molasses and top off with water. Set Dial n’Spray at 3-4 oz. (this is a good mixture to spray on your garden beds as well to turbo charge soil with beneficial micro-organisms for the purpose of turning all that organic matter you have been adding into humus. Potential garden cocktail components for your own important experiments: fish emulsion, seaweed extract, that edgy liquid at the bottom of the compost bucket, compost tea , and strong teas made from herbs with lots of mineral content such as stinging nettle or comfrey. The product EM (standing for Effective Micro-organisms) can probably be found with a web search for “EM Technologies’). I use this stuff, but there are several equal products available if you if you want to search it out. This spring I saw this product in some garden catalog I received, though I can’t remember which one it was. This is a workhorse crop for cool and cold weather. It is bitter only in hot weather. Easy to grow, hardy, nutritious, delicious. Mix it with any mixture of sorrel, parsley, spinach, pea shoots… or any other cool weather crop growing in your cold weather garden, add pecans or walnuts instead of pine nuts, and process it into a killer winter pesto. Spread this pesto onto a good slice of bread with peanut butter… FABULOUS!! Buy two 40+ gallon-sized trash cans with tight-fitting lids, green or brown in color. Fill one with a 50# bag of seed-starting medium that has vermiculite in it as a component (because it makes the medium more visible when it is on a garden bed; you can tell where you just seeded if you cover it with this mixture). Keep any small hand tools that you use when seeding, on top of the medium in the trash can. Buy 10 lb bags of bonemeal, and 4-5-5 or similar organic fertilizer; buy two 25# bags of composted cow manure… store these in the 2nd trash can along with a measured scoop or a cup. Store them in a corner of the garden next to the compost bins or surrounded with cosmos so they are handily located when you need it. Keep your ears open about news of rain-ruined hay or straw. Store bags of leaves that you score along streets before the city picks them up and compost them for killer mulch. Stone mulch raises the temp around plants by 1-2 degrees (the same as black plastic). Bark mulch and pine needles will absorb nitrogen from the soil to facilitate composting action… make sure your plants get a dose of organic fertilizer to compensate if you use this mulch. Watch for streets lines with white pine… needles drop in the late summer and can be picked up using a snow shovel and trash bags for great looking free mulch for ornamentals and evergreens. Buy clean straw as a last resort ; it is weed free and generally reasonably priced. Hay is to be avoided (unless you compost it completely) because it contains seed-heads that will sprout. You should never labor so hard in the garden that you are unwilling to at least walk through your garden the next day. Each day, regardless of the weather, you must at least walk through the garden and pick five weeds, if you can find them, as you are passing through. You must consciously develop a ruthless attitude about pulling out plants which aren’t producing well, which you have too many of, or which have passed their prime for eating. Nothing must be done today (except for tenant #2). There is always tomorrow. Repeat the mantra “March and July until I die” one hundred times. At the end of this you will always remember to start your seeds in March and July for spring and fall crops. Focus on developing a seed starting system that you can use year after year with the least amount of effort. Develop an aggressive composting program. Keep trash bags in your vehicle for spontaneous compost material gathering. If you don’t loose plants occasionally to freezing temperatures, you aren’t pushing the temperature boundaries enough. Your loved ones are more important than your garden. The Four-Season Harvest (1992) , Eliot Coleman, Chelsea Green Publishing. Written by the Warrior God of season extension. Inspirational information from a Zone 4 market gardener who produces food for his local market from September until May. American Gardener’s Calendar (1806), Bernard McMahon. A classic, available as a reprint. Fascinating reading about this Philadelphia seedman’s methods of growing all sorts of veggies out-of-season. McMahon reputedly was Thomas Jefferson’s primary source for seeds. The 12-Month Gardener (2001), Jeff Ashton, Lark Books. Solid season extension advice for home gardeners in the Carolinas. Clear details for the construction of low-budget greenhouses, re-bar stoop-houses, cold frames, and cloches. Out-of-print . How to Grow More Vegetables, John Jeavons, Ten Speed Press. With good reason it is now in its umpteenth reprinting… solid information re: high performance gardening in raised beds. Getting the Most From Your Garden (1980) Rodale Press. An editor’s compilation of information from lots of folks including home gardeners, from all parts of the country. The subject matter focuses on “Using Advanced Intensive Gardening Techniques”. Now out-of-print. I found this book inspirational and quite applicable in my own search of The Way. Highly Recommended. French Market Gardening (1909) John Weathers. This Englishman spent several decades working with and observing French market gardeners; he wrote this book of “Practical Details of Intensive Cultivation”. One of the several outstanding ideas I adapted from this worthwhile tome is the use of cloches to start seedlings. A terrific view of Western World market gardening when horse manure, harvested daily in enormous amounts from city streets, was the fertilizer fueling year-round, local food production. Stone Mulching in the Garden (1949) J.I.Rodale, Rodale Press. This book profoundly changed my understanding of the extensive opportunities and benefits of mulch in the garden and landscape. Rodale’s Color Handbook of Garden Insects (1979) Anna Carr, Rodale Press. Intelligently assembled guide for identifying the critters in your garden. The Encyclopedia of Natural Insect and Disease Control (1984), Rodale Press. Good companion to Rodale’s Color Handbook for figuring out how to deal with it organically. Farmers of Forty Centuries (1911) F.H.King. Reprinted by Rodale Press. King, while head of the USDA, traveled to Japan and China for the express purpose of studying the methods of agricultural people who had successfully farmed the same land, continuously, for 4,000 years. King was a keen observer, with an open mind, and a broad base of knowledge about the subject. A captivating read. The New Seed-Starters Handbook (1988) Nancy Bubel, St. Martin’s Press. Anything that Nancy Bubel writes is worth reading. The broadest and most applicable information I have read about seed-starting. Square Foot Gardening (???) Mel Bartholomew. Probably out-of-print, but worth reading about planting in small areas. The One-Straw Revolution (1978) Masanoba Fukuoka, Rodale Press. Radical no-till approach to agriculture that produces superior results. The principles in this book are VERY applicable in a home garden environment to achieve growing areas that, as time passes, require less and less work. Companion works for understanding no-till in your garden is Ruth Stout’s books as well as Mollison’s work. No-Work Garden Book (1971) Ruth Stout, Rodale Press. The crusty Grand Dame of home gardening discusses sheet compost and year-round mulching strategies that fit it well with a low-input garden philosophy. Permaculture: A Designers’ Manual Bill Mollison (1988) Tagai Publications. Written by the Godfather of the Permaculture Movement. This systems-driven, wholeistic approach to gardening (and communities as well) is articulated locally by terrific workshop presenters like Chuck Marsh and Andrew Goodheart. Mollison’s “Designer’s Manual” is epic in scope and you will understand, after reading it, why it has been the impetus for a whole movement of design throughout the world. Though I didn’t intend for this handout to get this complicated, I put a lot of time into it for folks who have attended this workshop. I’d appreciate it if you would not reproduce this information unless you ask for my permission first. You can reach me at jashton@progressivecci.com. I’d love to see photos of your own high performance results in the garden to use in future workshop presentations. Please don’t send more than four jpegs at a time because it will bog down my system. If you send me any photos, please tell me where your garden is, who you are, and what we are looking at in the photo so I can always give credit where it is due. Thanks!